* Listed PPC boards: '''RB1000, RB1100, RB1100AH and RB800'''. After the build process is done, upload newly built image to the router and import it as described in [[#Importing_image|section above]]. <td>Set if interface is either static or dynamic. * ''dynamic'' interface will add virtual-ethernet automatically when virtual machine starts. * ''static'' interface have to have created virtual-ethernet interface at the time of creation of the entry. 3 Where it can be used? Listed PPC boards: RB1000, RB1100, RB1100AH and RB800. Each Metarouter instance uses the same amount of resources as a stand-alone RouterOS installation. It means that you need a minimum of 24MB of RAM for each RouterOS virtual machine plus memory for the MetaROUTER host itself. It is suggested to have more than 24MB memory available for each Metarouter. Upcoming RouterOS versions will have ability to run virtual machines with less than 16MB per machine. Note: It is possible to run other virtual machines with less than 24MB RAM per machine if the virtual operating system is OpenWRT. The 24MB limitation is only for virtual RouterOS installations. Currently on one host you can create up to 8 virtual machines and up to 8 virtual interfaces. Workaround to have more than 8 interfaces in total is to use VLANs. In future versions it will be possible to add up to 16 virtual machines. Also it is not possible to use external storage devices (Store) in the metarouter virtual devices. As you can see, creating virtual router is quite easy, you just have to specify name of the router, how many RAM will be allocated for it and disk size that will be used by virtual router. Explanations of all other properties are available in reference manual. If you are not satisfied with our prebuilt version of OpenWRT, then you can build and use your own image. Note: Patch v1.2 adds newer kernel support which makes it possible to compile with latest OpenWRT revisions. This patch also adds PowerPC support (ability to run OpenWRT image on RB1000 and RB1100). 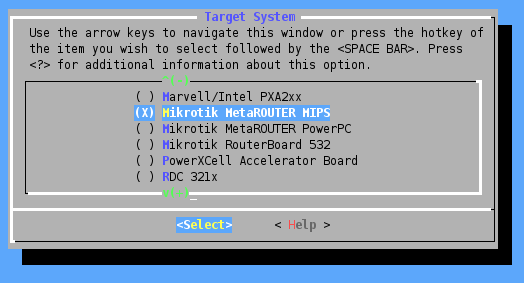 Go to Target System menu and choose Mikrotik MetaROUTER MIPS or Mikrotik MetaROUTER PowerPC from the list depending for which platform you are building the image. disk-size (unlimited|0..4294967295[kiB] ; Default: unlimited) Disk size that will be allocated by virtual router. used-disk (integer[kiB] ;) currently used disk space by virtual router. dynamic-bridge (string;) If set, dynamic interface will be automatically added as port to specified bridge interface. static-interface (none|name-of-iface;) Assign physical interface on the router to static virtual interface. This binds physical interface of the host directly to the guest instance. type (dynamic|static;) Set if interface is either static or dynamic. dynamic interface will add virtual-ethernet automatically when virtual machine starts. static interface have to have created virtual-ethernet interface at the time of creation of the entry. When attempt is made to create MetaROUTER guest on the router error message is given that there is not enough resources on the router to create guest. This problem is resolved in 5.12 and later RouterOS releases. If you are using a newer release and still encounter the problem on the router you have to reinstall the router using Netinstall tool. RouterBOARD RB1100AHx2 reports similar message, but MetaROUTER feature is not currently supported on this router. All other routers form this architecture that support MetaROUTER feature are not affected. Other issues that do not fit the description most probably are caused by RouterOS misconfiguration and does not have a common denominator and have to be checked case by case. This page was last edited on 30 September 2016, at 15:50.